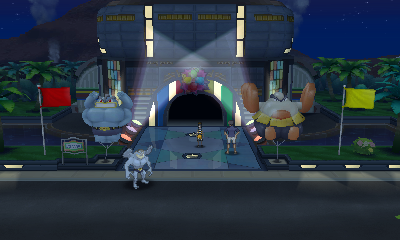 The Battle Royal is a brand new battling format introduced into Pokémon Sun and Moon. Here, you and 3 other people go head to head in a 4-way battle. The game works in a point system. If a Pokémon is knocked out, the Pokémon who hit the opponent last's trainer's Pokémon gets a point. The game ends when 1 person has all of their Pokémon knocked out and the person with the most amount of points is declared the winner. 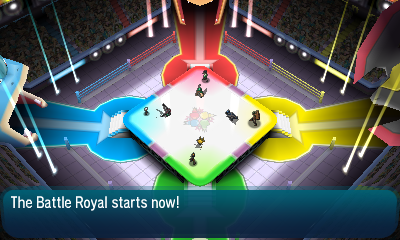 The Battle Royal Dome is the place to have all your Battle Royals. 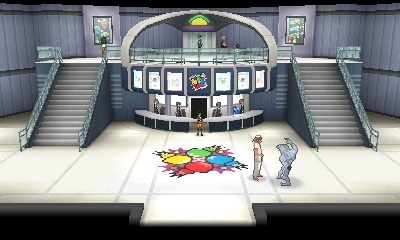 The inside of the arena is shaped like a boxing ring and the entrances for the Trainers are shaped like Pokémon's heads. Each trainer appears from the mouths of these Pokémon.